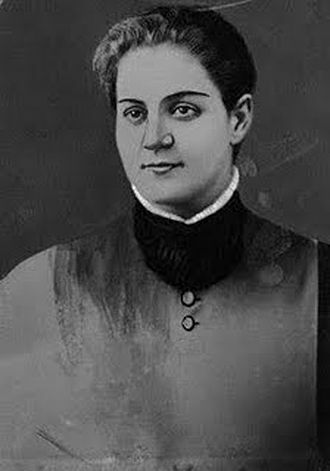 Jane Toppan was an American serial killer who was also known as Jolly Jane. She was born in 1857 with birth name Honora Kelley in Boston and died on August 17, 1938. Jane was apprehended on October 29, 1901, in Massachusetts for murders committed by her from 1895-1901. She confessed to 33 murders in 1901 but was found not guilty because of insanity. Jane is quoted saying she wanted "to have killed more people, helpless people, than any other man or woman who ever lived...". Jane"s parents were Irish immigrants, and she was very young when her mother, Bridget Kelley, died of tuberculosis. Her father, Peter Kelley, was an alcoholic whose nickname was "Kelley the Crack" where crack meant crackpot. Peter Kelley worked as a tailor, and it is said that his supposed insanity drove him into madness which resulted in him sewing his own eyelids shut. Peter took his two youngest children, Delia Josephine (8-years-old) and Honora/Jane (6-years-old) to the Boston Female Asylum in 1863 which was only a few years after Bridget died and never saw them again. According to the asylum records, the girls were, "rescued from a very miserable home." The Boston Female Asylum was an orphanage founded by Mrs. Hannah Stillman in 1799 for needy female children. Honora Kelley became an indentured servant in November 1864 in Lowell, Massachusetts for Mrs. Ann C. Toppan. Honora adopted the surname although the family never adopted her and later used the first name, Jane. Jane Toppan began training to be a nurse in 1885 at Cambridge Hospital where she experimented with patients by administering morphine, atropine and altered their prescribed dosages so that she can see what happens to their nervous systems. Jane had ample time on her hand as she spent a lot of time alone with the patients. She made fake charts for the patients and gave them medication to go in and out of consciousness. Jane Toppan said that she gets a sexual thrill from seeing patients almost dying and then coming back to life and then dying again. It is said that Jane would lay in bed with her dying victims and hold them close which gives her the sexual desire she seeks. Jane began working at the Massachusetts General Hospital in 1889 which did not last long because she took several more victims and was fired about a year after. Jane returned to the Cambridge Hospital shortly after she was fired for recklessly prescribing opiates. She still pursued her nursing career after being fired and turned to being a private nurse. Jane started killing people by poisoning them in 1895, and her first victims were her landlords. She killed her foster sister in 1899 with strychnine. Jane murdered Alden Davis" wife unknowing to anyone and shortly after moved in with him in 1901 and his two daughters in Cataumet to take care of him/Alden. Jane killed Alden and his daughters within weeks of moving in. Jane did not take much time to move back home and start courting her foster sister"s husband and shortly after killed his sister and made him ill so that she can nurse him back to good health. Jane felt she needed sympathy from him and poison herself, but he did not fall for it and put her out of his house. Jane was arrested on October 29, 1901, for murder after surviving family members of the Davis family ordered a toxicology exam on Alden"s" youngest daughter which came back positive for being poisoned. Jane confessed to 31 murders in 1901 but was found not guilty by reason of insanity on June 23, in the Barnstable County Courthouse and was sentenced to the Taunton Insane Hospital for life. She was found to be insane because of her history of suicide attempts. Jane Toppan serial killer is a male serial killer. Jolly Jane is a male serial killer.